You probably don’t even realise this, but there are fire risks present in your home every day. Some of these well-known hazards include candles and cooking pans left unattended, covered electrical heaters, overloaded plugs, and unfinished cigarettes. Although you might think that these are so obvious that everyone would remember to take care of them, that is—unfortunately—not the case. Last year, only in the UK, 248 people lost their lives due to a fire at home. Understandably, many of these accidents could have been easily prevented. That is why the UK’s Home Office decided to hire one of London’s leading advertising agencies, FCB Inferno, which is part of global advertising network FCB. The network dates back to 1873, and now boasts 9000 employees in over 90 countries, with 150 of those working at FCB Inferno. After helping release the world’s first ‘resellable’ magazine—The Big Issue—FCB Inferno comes with a new, eye-catching campaign simply titled “Fire Kills”! A short 30-second spot is accompanied by a series of posters, TVC cut-downs, and social assets, which were all designed to be used nationally by Fire and Rescue services locally and on the ground. Fire Kills was designed to disrupt complacency and so the creative reflects how careless behaviour can easily lead to a devastating fire, and crucially, puts in the spotlight the testing of smoke alarms within the framework of greater fire safety awareness. Apart from the ad, there is a series of “stay-safe” steps that you can follow to lower the risks of starting a fire in your home. 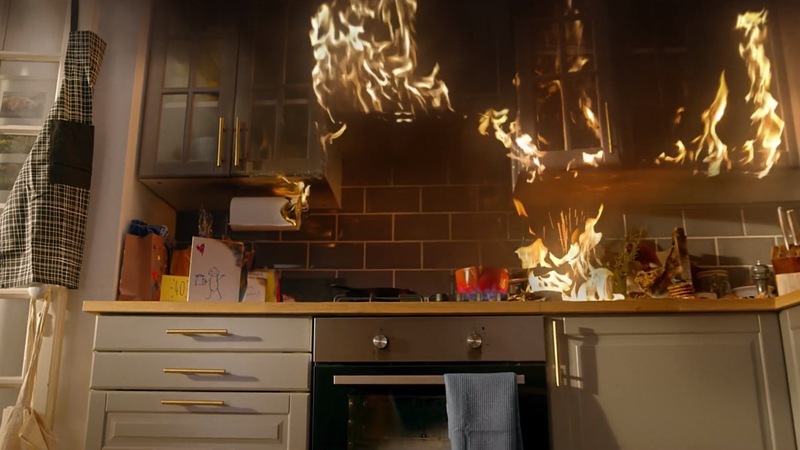 The ad uncovers how small, easily and frequently made mistakes can ignite a spark for something much more devastating; whether it would be throwing a tea-towel down near the hob, keeping flammable objects near candles, or simply just overloading the extension cords. The spot was filmed to simulate one continuous take and allows the camera flow through a series of rooms, focussing on each ignition point in detail as the flames start bursting from scene to scene.